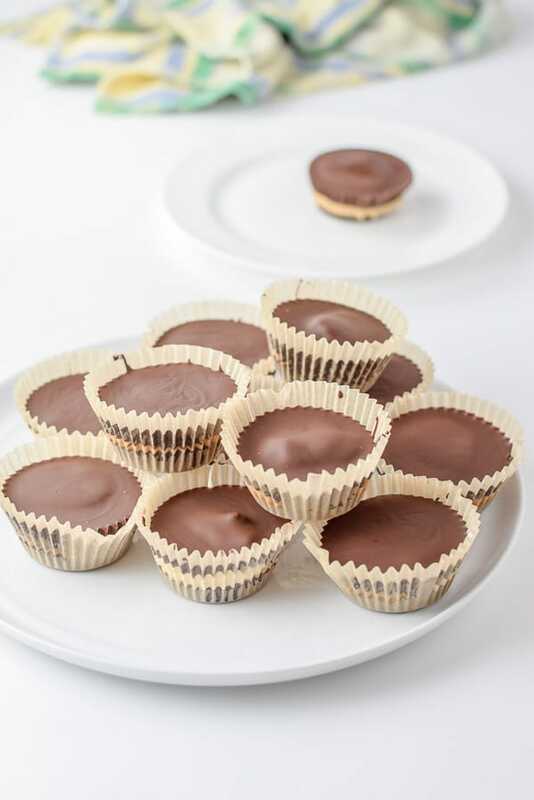 This dark chocolate almond butter marshmallow cups are so delicious! Why? Because they also have gooey caramel and delicious cashew butter! As you probably already know, I’m a chocoholic. And when you add caramel, marshmallow and a nut butter to that chocolate – ooo, la-la! It makes me want to do a dance. The combination of these ingredients is nicely balanced. 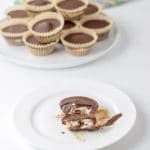 You take a bite and the chocolate is crunchy, the marshmallow is gooey, the caramel is slightly chewy and the almond butter melts in your mouth. I keep these in the fridge or freezer because in the summer months, they would melt if left on the counter. It was fun to witness the chocolate smiles on the sides of everyone’s mouth. When I ate mine after I made these, Christopher laughed because not only did I have chocolate at the sides of my mouth, I had marshmallow on my chin. Charming! I do well at parties and you can take me anywhere. 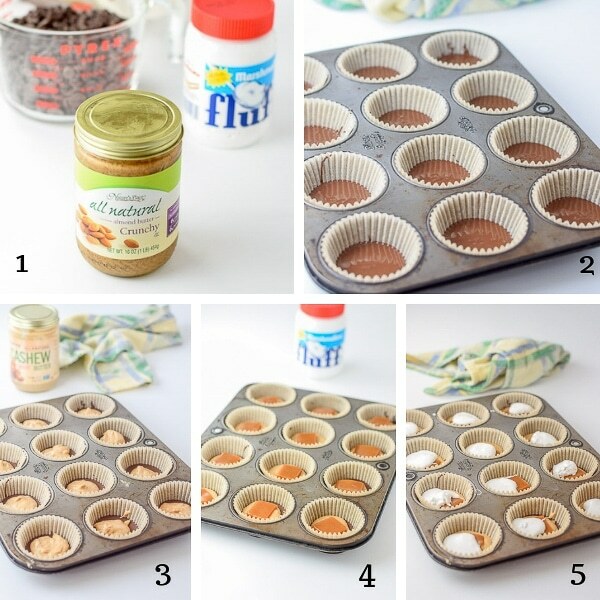 Get your muffin pan out and line it with muffin papers! By the time I’m done adding the marshmallow fluff, the chocolate on the stove has finished melting. We are ready to eat, peeps!! 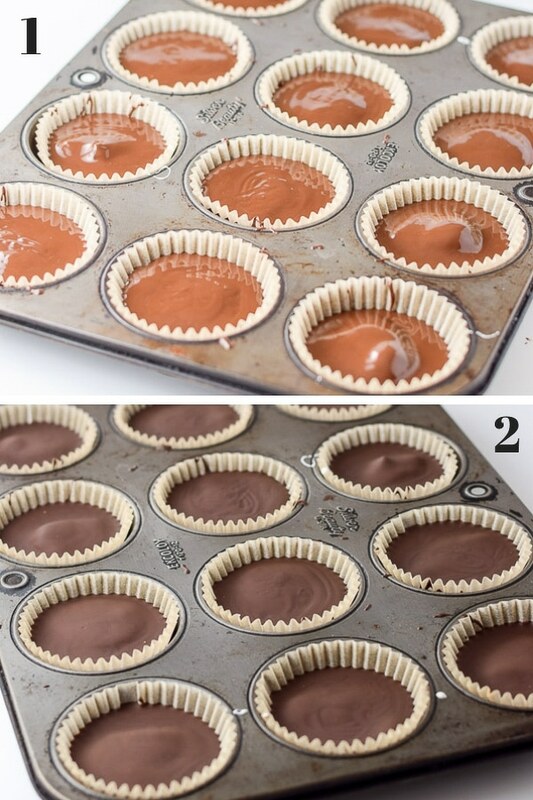 I take each dark chocolate caramel marshmallow cups out of the muffin pan and pile them on a plate. Wait, all but one cup which I unwrap and put on a plate, anticipating eating it. Now, I take a knife and cut into my plated cashew cup because I want to eat it STAT! But first I have to take another photo. 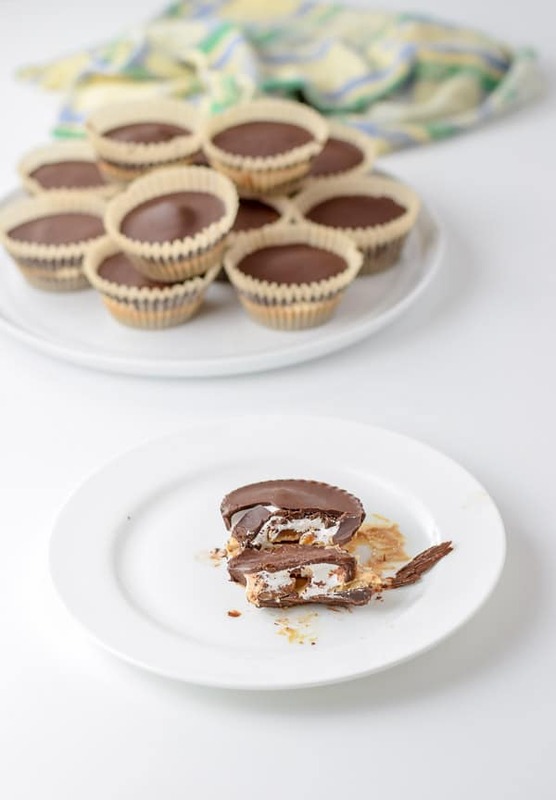 I hope you enjoyed this dark chocolate caramel marshmallow cups recipe. And may all your dishes be delish! These delicious candies are so good that it will make you want more and more. Perfect to bring to a party! I too can eat marshmallow fluff by the spoon and I often do. My new thing is to have one of my chocolate muffins and put some almond butter on the cap and a dollop of marshmallow fluff. It totally melts and is yummers! That title is a mouth full but then, so are those delicious, delectable appearing chocolates! Lovely. This sounds so good! Cashew butter is one of my favorites, and in my opinion it’s not used in enough recipes. I’m so glad to have an excuse to buy some and then make these! Elizabeth! Thanks. I know, I love cashew butter! So different than the other nut butters. Such a lovely recipe! I imagine I’d want to eat all the ingredients as I was making them though, but they’re so easy I think I could get my kids to help me with them, although then we’d probably have none left to eat properly at the end! Yes, that is my problem too. I usually make them when I know I have to bring them someplace, or else in the gullet it goes! This is great for sweet treats and looks delectable appearing chocolate. This recipe must try on. This looks like a great flavor combo!! Thank you Kathryn! They are so delicious! Mmmm. These look ooey and gooey and oh so good.